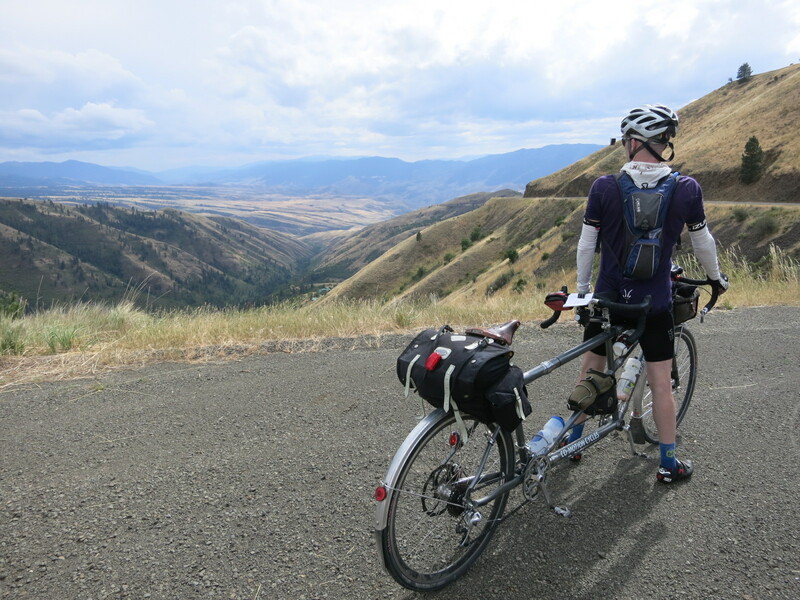 We left the Salmon River at Kooskia to climb Winona Grade– a beautiful dirt climb with nobody on it but us– up to a high meadow area where the land was being worked, either through crops or livestock. I had thought we would reach a summit and then be rewarded with a mighty downhill for our efforts, but instead we noodled around this rural area for at least 20 miles. 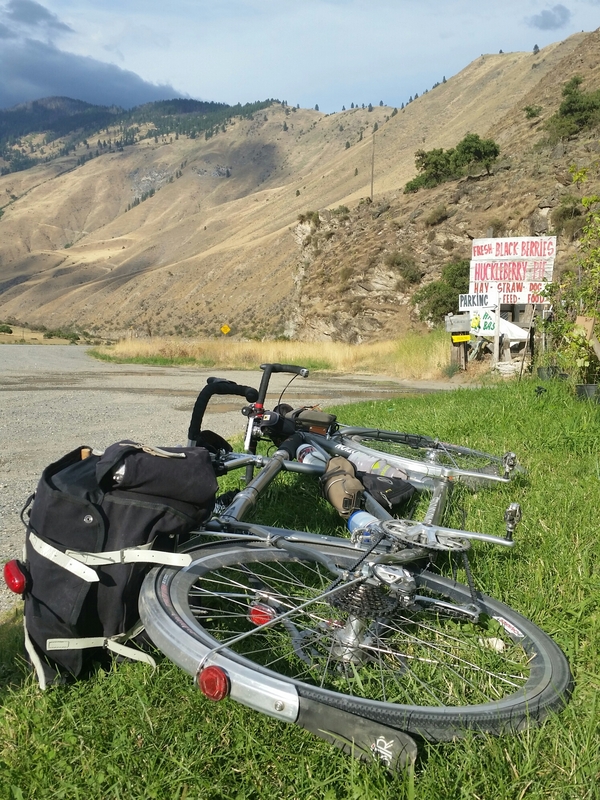 The climb up Winona Grade had no marked summit, unless you count the sign that says “This road not maintained in winter months.” So far, Idaho has a very matter-of-fact feel. Climbed a mountain on dirt? Good for you. We didn’t name it, but yes, I suppose it was a mountain. 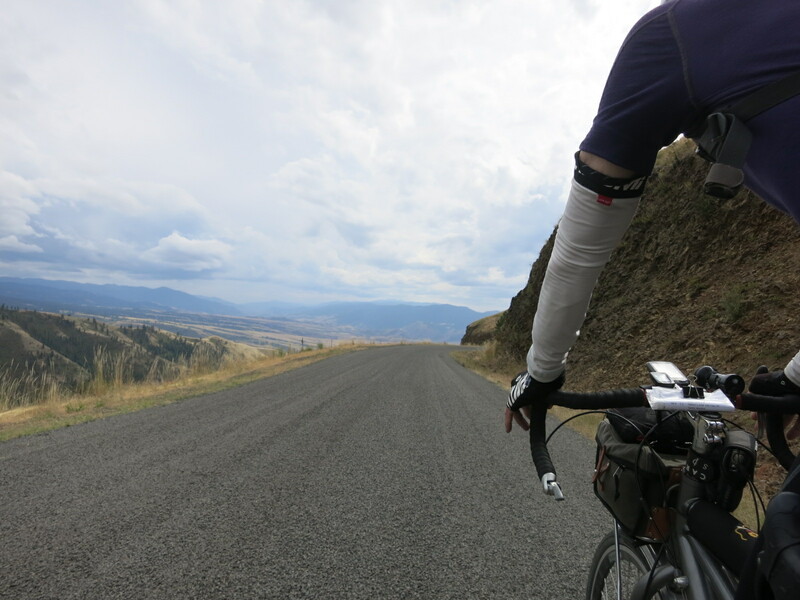 We made our way over to Grangeville, where a local recommended we take the old road up White Bird Hill– also a mountain, I’d like to add. We followed his advice and were rewarded with another sublime gently twisting climb on a quiet back road. 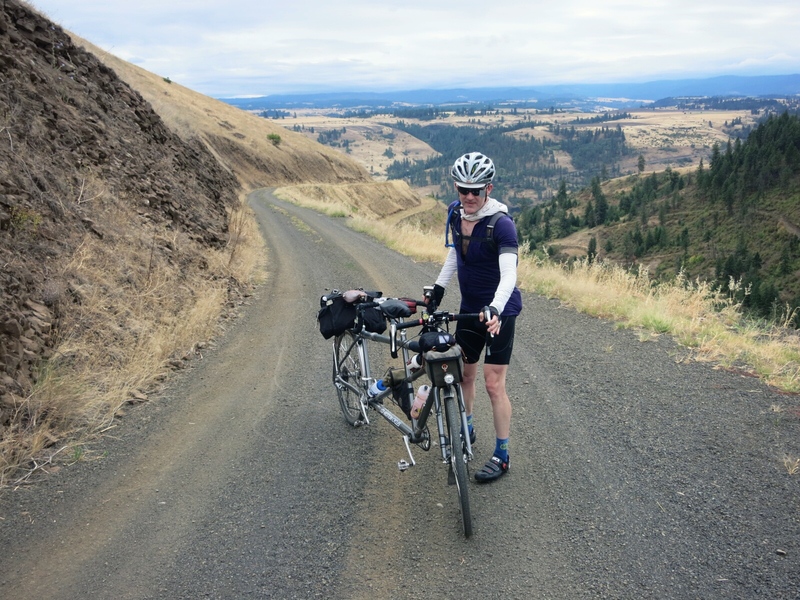 Early in our climb, we met Sarah, a TransAm rider who was visiting family and doing some day riding. 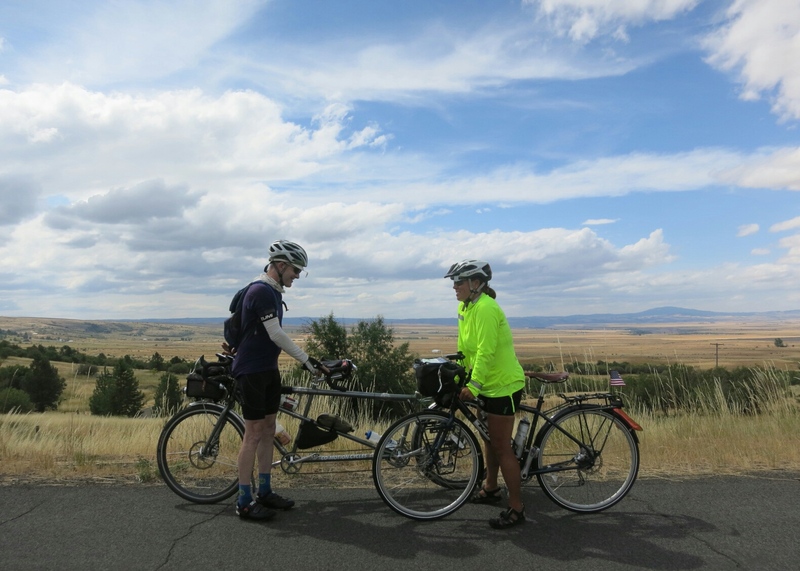 She said she was taking three months to ride coast to coast, and averaging around 50 miles per day. Seeing all the cross-country riders between here and Missoula has enticed me to consider how Felkerino and I might accomplish such a trip. At the White Bird Hill summit, we reconnected with the main road and soon began a rapid descent. What does rapid mean? Our tandem hit 53.5 miles per hour and stayed there for a while. See what I mean about hill versus mountain terminology? This was a clear smooth downhill without no big switchbacks, but even so, very fast! Felkerino said he could hear the air roaring around him. I didn’t hear any roaring and I did not know our speed at the time, but I knew we were moving fast so I was concentrated on sitting still as a stone in the drops. 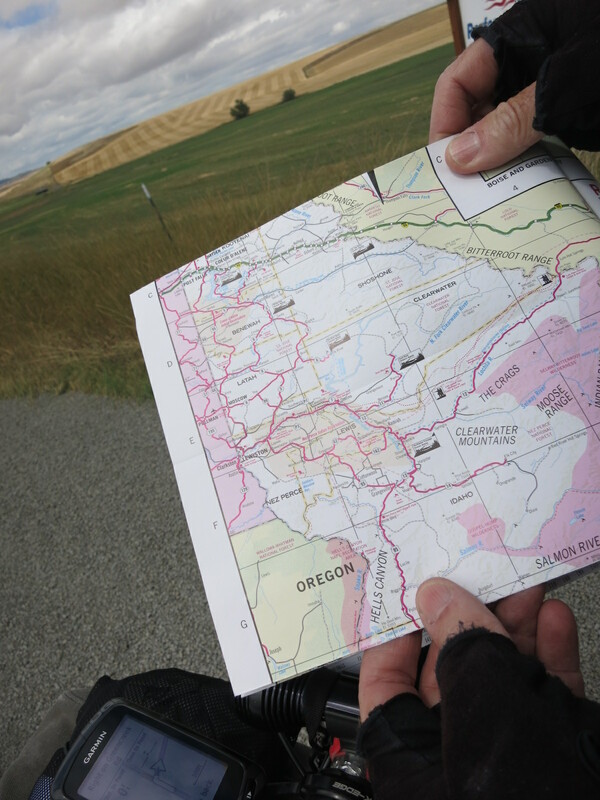 Ah the excitement of bike touring! After our mongo descent down the hill the road leveled out for the remaining miles to Riggins. We reconnected with my new friend, the Salmon River, and passed a lot of old gold mining territory en route to our overnight in Riggins. 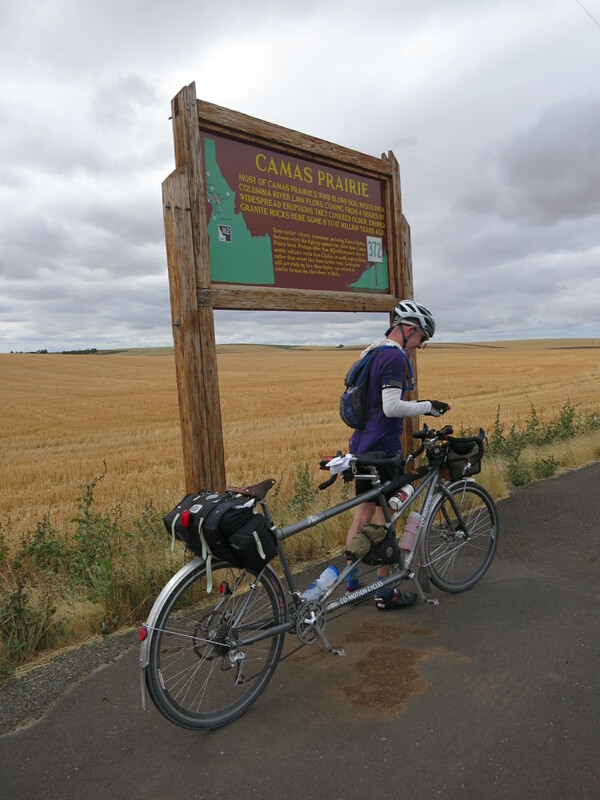 I liked this day for the varied terrain, unpaved climbing section, and quiet roads. Spending the night beside the Salmon River in one of Idaho’s main rafting cities was also a treat. We didn’t do any prospecting– we’ll save that for another trip.